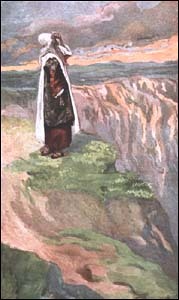 James J. Tissot, 'Moses sees the promised Land from Afar' (1896-1900), Gouache on board, The Jewish Museum, New York. Before we pursue listening for God's voice, we need to confront some patterns of unbelief or fear that may be lurking within us and keeping us from the adventure of hearing God. First, there's the belief that God doesn't really care about my everyday life -- or is too busy to speak to me individually. This stems from unbelief, from an inadequate understanding of God. Yes, my friend, God loves you personally and individually, and wants to communicate with you and you with him. It's pretty amazing, but it's true. Related to this is a concern that God is too busy to be bothered with me and my concerns. I once asked a man whose bicycle shop was failing if I could pray for his business. He said, "No, God is too busy to be concerned with something this trivial." This comes from a wrong view of God -- a God that doesn't really love individually and a God who has limited time and resources. It's as if there are only so many incoming lines to God Central and we need to keep these open for real emergencies. You can see how silly this is when you realize that God is infinite and has created the universes! So don't let these fears and wrong views of God hold you back. Second, there is a belief that inhibits listening for God's voice: that I'm not worthy or holy enough for God to speak to me. I find myself sinning and I feel unworthy. Why would he want to talk to a sinner like me? The truth is that God has been talking to sinners for a long time. Consider Jacob, for example. He was a schemer and conniver who cheated his brother out of his birthright and lied to his father. Yet God loved him and began to speak to him -- and in so doing changed his life forever. True, you and I are not worthy, even though we try to live lives that please God. We fall short. We fail. But God extends his grace to us -- pure favor that is neither earned nor deserved. Confess your sins to God and seek to be right in his eyes. Do that and you will be forgiven (1 John 1:9). Just realize that compared to God's holiness, "all our righteous acts are like filthy rags" (Isaiah 64:6). At our best, we're only relatively pure before God. We trust in his grace and in his righteousness alone. Don't let your sense of unworthiness keep you from seeking to hear God's voice. "Give me a verse, not a voice." Let me put this fear to rest. God's written word has full authority. He will say nothing to you that contradicts the Bible. Rather, the Bible is the authority by which we can test any purported word from God. However, to resist listening for God's voice because you now have the Bible, places you at odds with all the examples of God's interactions with humans in the New Testament. For men and women in Bible days, hearing God's voice didn't threaten the revelation of the Scriptures. Indeed, it helped them understand what God wanted to communicate to them in the moment, to help them in their day by day lives and ministries. To resist God speaking to us today seriously undercuts the New Testament pattern that we have been given. It would mean that God's intimate communication is not for us today. God hasn't gone mute. The Acts of the Holy Spirit continue today. Praise God. Fourth, there's often a fear that God will tell me to do something I don't want to do. He'll tell me to go to Africa where there are snakes and insects. And you know how I hate snakes! This fear isn't really about snakes. It's about belief in God's goodness. It's about trust. It's about obedience to God. It's about discipleship. My dear friend, you need to surrender your life and your future to Christ. He knows the journey; you don't. You can trust him to lead you every step of the way. If you can't trust him, then what does your "Christianity" really consist of anyway? We must either wallow in our unbelief and resistance to obedience, or we stand up in faith and say, "Where you lead me I will follow." That's discipleship. Scary? Yes. But that's the adventure we see lived out by the heroes of the Old and New Testaments. Fifth, there's a fear that if we seek to hear directly from God, we'll "go off the deep end." We'll become fanatics who are out of touch with reality. Our parents and friends might disapprove of us. Hearing voices, they'll say, is a sure sign of insanity. Who is the author of that fear? Satan, who doesn't want you to trust Jesus and follow him where he leads you. All of us struggle at times. You may have struggled with mental health issues such as deep loss or depression. My heart goes out to you. I hope you'll find this study helpful to you. Of course, certain mental health issues relate to difficultly in sorting out what's real in our world and what isn't. If that is what you're struggling with, please talk about this study with both your mental health professional and your pastor before taking this course. It simply isn't wise to add an additional level to your struggle with discernment -- in this case, spiritual discernment -- until you've reached some stability in what you're currently dealing with. It's true, however. As you go deeper with God, your non-spiritual friends won't understand. They may think you've "gone off the deep end." They'll think you're strange. You have to choose: Can I trust Jesus enough to follow him fully? Do I desire the approval of people more than I desire the approval of God? I do want to assure you, however, that you'll find God can teach you to swim quite well in the "deep end" of the pool. You won't drown, you'll flourish! I hope that as you study the Scriptures you'll jump in. The water is truly fine! As you begin this series of lessons to help you discern God's voice, I want you to find a mentor -- or at least a peer with whom you can share in this new lifestyle. Listening for God's voice and promptings, and then doing what he shows you to do, is a learned skill of sorts. But it is more than that, it is an exciting way of life. Manual skills can be learned by watching YouTube videos. But how does a new police officer become sensitized to the problems and crimes of a neighborhood? By riding along with a more experienced officer who points things out that the average person just doesn't see. In the process, the novice officer acquires trained eyes. Though God has helped many people learn to hear and identify God's voice and promptings on their own, that is not the easiest way to learn. It is best to find a mentor in your church or community to whom you can go with questions that may come up. Make sure this is someone who actually believes in and practices listening for God. In some churches your pastor might be this person. Or it might be a spiritually mature man or woman. On some occasions, your mentor might even attend a different church. Nevertheless, diligently search out this person by prayer and by suggestions of others. In addition to a mentor, you need to find a spiritual partner who can walk this journey with you. You'll learn from each other and be able to bounce ideas off of each other. When I was in college, Edson Lee was my dormmate. We went to the same church on Sunday. But during the week we learned together a great deal together about listening to and obeying God. I can remember at the end of a day, we'd get together to share about how we had seen God in action that day. One of us would always say, "God sure knows what he is doing!" Note: In this course we share responses to discussion questions in an online forum. But I think it is best to share your experiences in hearing God's voice with your spiritual partner and mentor, who know you, not online. The reason is this. In any kind of cyber sharing, people can't know you in your real-life context. Helpful, honest feedback on hearing God's voice needs to take that context into consideration. For our spiritual partners we need people who can get to know us in a more rounded way than someone would be able to online. So find a mentor if you can -- and for sure find a spiritual partner, a peer who is willing to walk this portion of the journey with you. Get this person to sign up for this study with you. Then get together often, in person or on the phone, to share how you see God working. Beyond a mentor and a spiritual partner, you'll need a notebook or journal in which to write down what God is showing you. It's best if your notebook has decent binding so the pages don't start falling out. I found a journal a similar size to my Bible. What I settled on was a brand called Markings, a 5" x 8" journal by C.R. Gibson (markings.com), widely available in the United States. But really, any notebook will do. Make it a point to get one for this study. It's absolutely essential for you to begin or renew a daily Quiet Time, 5 to 10 minutes (or more) that you spend with God in prayer, reading Scripture, and listening. I'll talk more about that in Lesson 1 , but start today! Available in PDF, Kindle, and paperback formats. Here's the checklist to complete so you'll be ready to begin the study. Check it off when you've completed each item. □ Recruit a spiritual partner to study and share with. □ Begin or Renew a daily Quiet Time. Return to the page to sign up for this study. This is the position of some "cessationists" who believe that the miraculous gifts of the Spirit ceased at the end of the apostolic era.